I have had this book for a long time and decided to read it now along with some others about what has happened to our churches in the last fifty years. 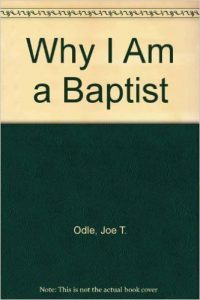 This book was published by Broadman Press in 1972 mainly for Southern Baptists, but contains contributions from independent Baptists including my former professor Noel Smith. Well known names of contributers are W.A. Criswell, Billy Graham, R.G. Lee, Vance Havner, S.E. Anderson, W.O. Vaught, Jr. Obviously the contributions range from Southern Baptists, Landmark Baptists, Independent Baptists, to very ecumenical Baptists. The interesting thing to see is how the last fifty years has softened the attitude among many Baptists about the denominational name and the separatist position. Where fifty years ago there was an unashamed use of the denominational name, today you might be hard pressed to find the name used on most of their own churches.